Equipped with the skills and knowledge from our Hypnobirthing course we both felt truly empowered and ready, even excited for the labour and then of course the birth of our baby. They say peaceful birth, peaceful baby and it is true! 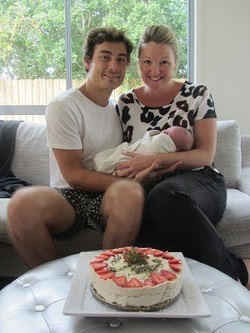 My partner Morgan and I had been planning a home birth to welcome our first child into the world. To some a little left field but after a nine-month journey of discovery we wanted only the best for the pending birth of our child. Surges begun after my waters broke at 10:30pm and by 2pm the next day our gorgeous daughter was welcomed into the world. Ari was born naturally without any medical intervention or drugs. Ari came out peaceful, her heart rate throughout the whole labour never deviated from normal. She was under no stress despite being a posterior presentation. Ari was breathed down and after an hour and a half her dad was there ready to catch her. I escaped unscathed with no need for stitches; I guess my cervix did open just like a flower!!! Morgan and I both attribute our amazing birth to the skills we acquired through doing the Hypnobirthing course with Carrie. I was also lucky enough to have Carrie attend my birth as a doula. Her support was exactly what I needed, she always knew what to say and when. As Ari was born Carrie was holding my hand and breathing her down with me (kindly reminding me when my pitch became to high)! Thank you Carrie I look forward to the birth of our next child and will be booking in your skills as soon as I discover that second line on the infamous stick!! !